Infrared and thermal imaging cameras can be utilised in many processes as they provide a safe and contactless solution for hazardous and hard to reach areas. 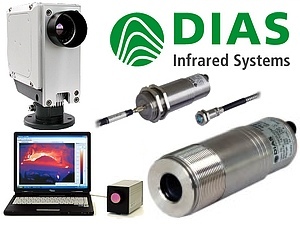 As a distributor of DIAS Infrared GmbH products, TMS Europe supply Infrared Pyrometers, Infrared Line Cameras, Thermal Imaging Cameras and other equipment. 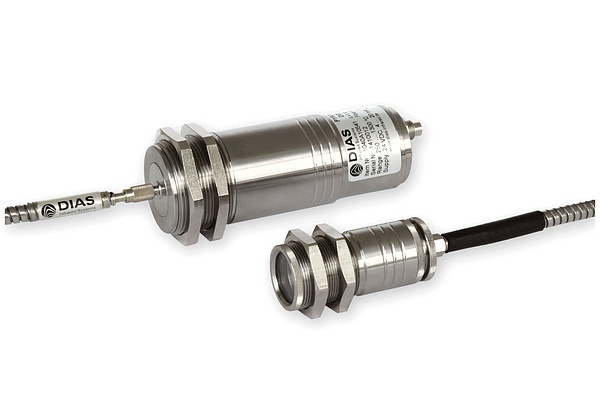 The digital pyrometers PYROSPOT DT, DG, DS and DSF are specifically designed for industrial purposes and are particularly suitable for temperature measurement from –40°C to 2500°C on non-metallic surfaces and coated metallic surfaces. This range of digital pyrometers are useful for glass and ceramics, paper and packaging, furnace applications, the chemical industry and the food industry. The casting house measuring system consists of a digital ratio pyrometer PYROSPOT DSRF 44N combined with a display and evaluation unit and a customisable software. It is specially designed for industrial applications in casting houses for temperature measurements of the iron stream from 700°C. The advantage of this system is its reliable temperature measurement even at very low and variable emissivities. A movement of the iron stream is balanced by the special optics that needs only a partial filling of the measuring field. The DSRF 44N detects from a distance of about 3 to 5m with an optical head, and to reduce influence of dust, the sensor head can be protected by an air purge adaptor and a sighting tube. Alignment of the pyrometer to the measuring object is made simple with the integrated laser aiming light. Various parameters can be adjusted to the respective casting process with the special software. For every casting process a relevant average value is output. Occurring faults, e.g. during gating, are hidden. The controller is programmed via an Ethernet interface and can be included in the remote maintenance. In this way it is possible to get access to the device during the production process, to optimize system settings and debug when necessary. The standard 0/4 to 20mA temperature linear output signal is still available of course. The measuring temperature is displayed on a large LED display. PYROLINE and PYROVIEW infrared line cameras allow high-speed non-contact measurement of temperature profiles and are specially designed for long-term use in fixed-mounted applications and are specifically suited for glass, wood, paper, plastics, gum, bulk materials, building materials (clay, brick), textiles, food and metals (non-ferous metals, rolled steel). The digital pyrometers PYROSPOT DSF 30NG and DSF 34NG are especially designed for applications in glass industry, realising temperature measurement from 600°C to 1800°C in the glass tank, working end, forehearth and feeder. The solid construction in robust cast housing with special mono fibre optics cable (up to 30m) allows usage even under rough environmental conditions and ambient temperatures of up to 250°C. Several air purge units with inconel tubes of different lengths are available for the special optical head and can be mounted together. The lens can be easily cleaned or replaced. In addition to the analogue output, the devices are equipped with a galvanically isolated interface (DSF 30NG: USB, DSF 34NG: RS485). Due to direct PC connection, parameters like emissivity, sub range and response time can be easily adjusted by using the comfortable parameterising and evaluation software PYROSOFT Spot. Why choose DIAS Infrared Technology as your industry solution? For further information contact our DIAS Representative James Driver on 01433 620535 or e-mail james@tmseurope.co.uk. Learn more about the DIAS Infrared range of products.